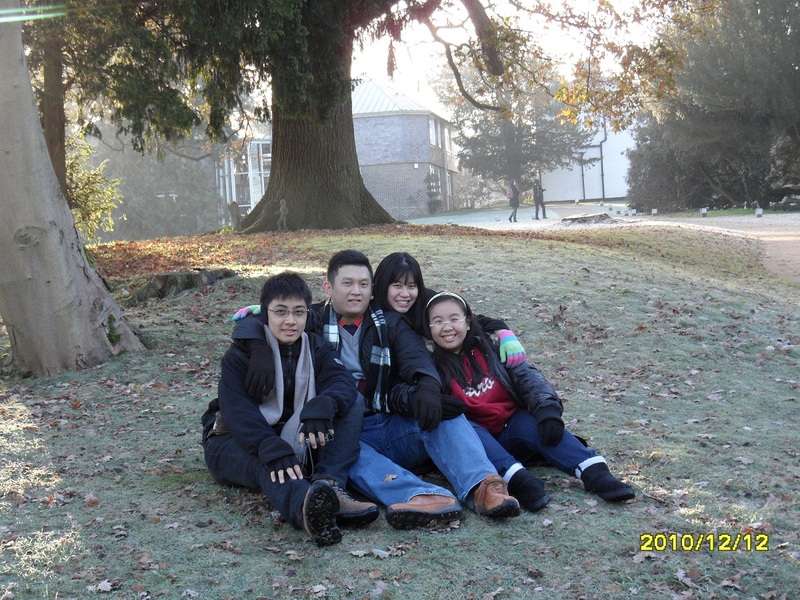 Raymond Tan was elated when four of his piano students made it through to the first Overseas Malaysian Winter Piano Academy (OMWPA), held in December 2010 at the Yehudi Menuhin School in Surrey, UK. “I encouraged them to go for it. I hoped that they would do well but I did not expect all of them to qualify,” he said. 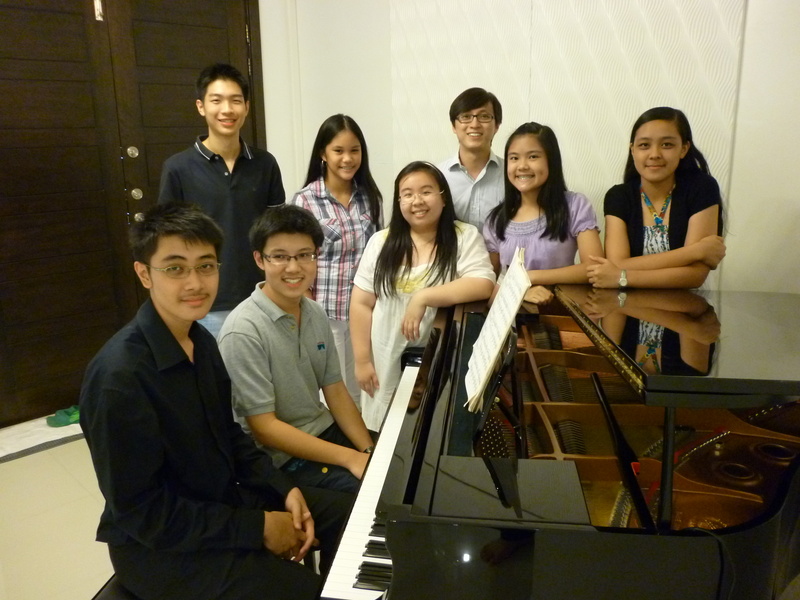 Benjamin Pau, Loh Chun Han, Stephanie Looi and Kuan Wy-Jane were among the first batch of 26 Malaysian piano students to have been selected for the OMWPA. And they have not stood still. Earlier this year, Benjamin was one of the five finalists in the Steinway Malaysia Youth Piano Competition 2012 while Chun Han was 1st runner-up in the Roland Piano Competition Open Category. Stephanie, meanwhile, is studying music and pre-med in the US and has received the Anita Norskov Olsen Endowment Scholarship for piano from La Sierra University, California. Jane got a distinction for her ATCL diploma and is currently pursuing a B.Mus. at College of Wooster in the US on a full scholarship. So, what makes a good music teacher? It all boils down to passion, according to Tan—passion for music and music teaching. “The teacher teaches because he is, first and foremost, interested in seeing his students improve, not so much because of the money,” he emphasised. Tan himself first started learning the piano at the age of 10, which, according to him, was “rather late”. Although he had expressed an interest in the piano from the time he was four, his father had been against the idea. 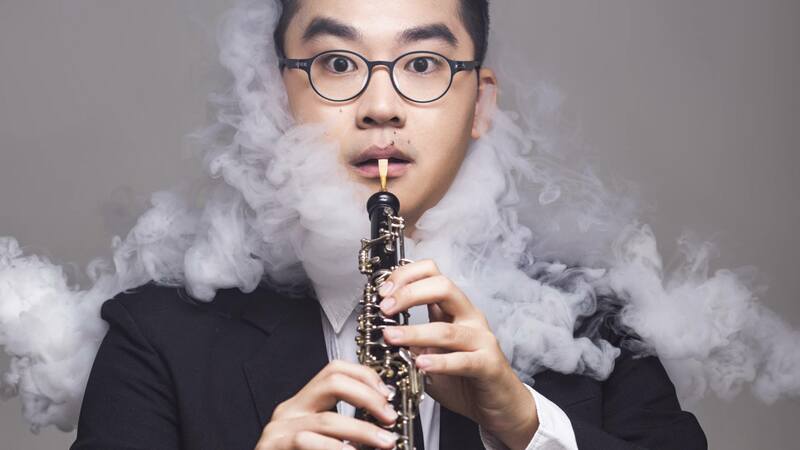 It was only six years later when his younger sister started her piano classes that Tan’s father recognised that he still harboured a deep desire to learn the piano and gave him the green light to begin lessons. “Thank God it wasn’t too late,” Tan said. “In fact it was a blessing in disguise because I might not have had the discipline needed when I was younger. 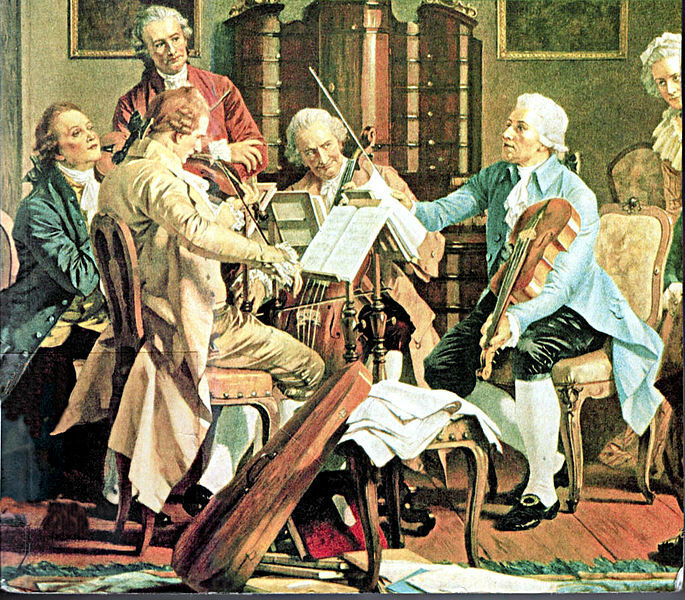 His first teacher, Ellen Sinaga, was instrumental in providing a solid foundation for his technique and musicality and helping him complete his grade 8 in five and a half years. Tan got his diploma a year later under Ann Francis. After completing secondary school, Tan enrolled in a three-year ICSA (Institute of Chartered Secreteries and Administrators) course in Tunku Abdul Rahman College, but knew even as he attended lectures that he would not be able to bear working in an office. 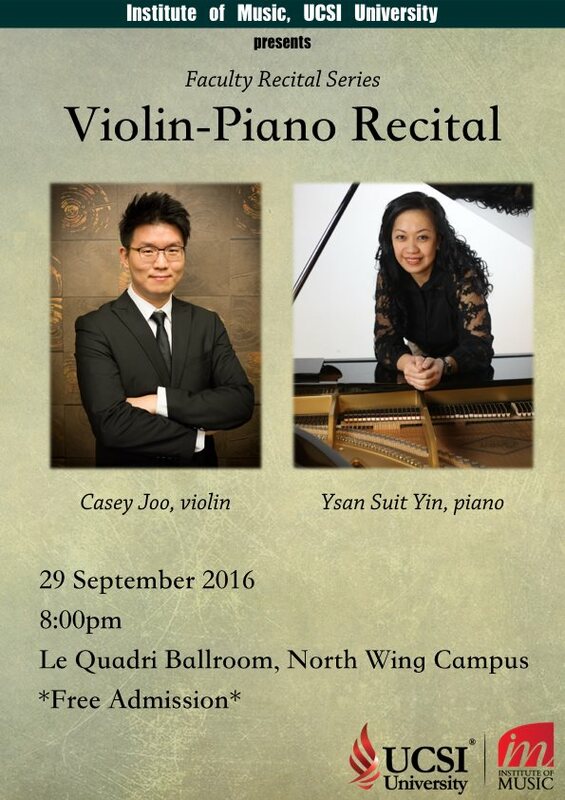 “My heart was very much in music and I remember telling myself that I would teach piano after I graduate,” he said. He didn’t have to wait long. After a year in TAR College, Tan got a place in Universiti Sains Malaysia (USM) where he completed a BA in music. “Guess what? My dad gave his approval this time and he did all the applications for my entry to the university,” Tan chuckled. A receptive group of students. 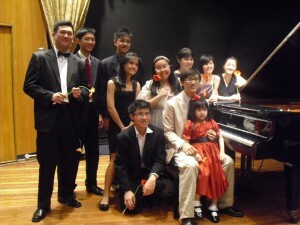 Tan is sitting on the piano stool (fourth from right). After graduating from USM, Tan continued his music education with masterclasses in Australia and Germany. “I must say that I still have much to learn,” he said. Currently, in addition to his private teaching, Tan is music director for a gospel music band called SAND. He also composes and his gospel songs have been recorded by Kingsway Music in the UK. Besides composing, he teaches a music appreciation course to non-music majors under the American Transfer degree programme in INTI College, Penang and is also the state representative for Trinity College London in Penang. This entry was posted on September 1, 2012 at 12:46 pm and is filed under Articles. You can follow any responses to this entry through the RSS 2.0 feed. I Am a music teacher in Christchurch, NZ, and currently have a pupil preparing for her exam in the St Cecilia School. As part of the preparation, the pupils are asked to present Program Notes about one song. My pupil has selected your music ,” Tears in a Bottle.”, from ” Because of Love” series. Would you mind answering some questions she has prepared please? Does she forward her questions in this comment box? I’m not sure if you received the above query, my pupil needing information about her selected exam song, Tears in a Bottle. Would you mind answering some of her questions please. She was most interested in the reason of the title. Thank you for taking a moment to reply.